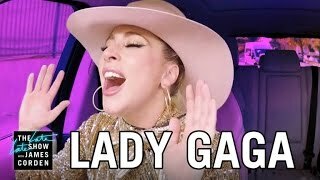 Lady Gaga's Carpool Karaoke With James Corden Is FINALLY Here And It's EVERYTHING! It's official! Lady Gaga' Carpool Karaoke with James Corden has dropped and its everything we dreamed! Lady Gaga shared a picture of herself posing with James Corden complete with matching pink cowboy hats with the caption "Had a lil fun with @j_corden today!" which got us all excited! Read more: WATCH Britney Spears Talks Men In The Passenger Seat During James Corden's Infamous Carpool Karaoke! They sung hits from across the stars career including classic songs Poker Face, Born This Way and Edge Of Glory as well as Gaga's new song Perfect Illusion. Read more: WATCH James Corden and Michelle Obama Dance To Beyonce In Coolest Carpool Yet! But the star didn't get off to a great start and James ended up with a crash helmet on just in case...LOL! Read more: WATCH James Corden And Stevie Wonder's Legendary Carpool Karaoke! The 30-year-old singer jumped in the car to promote her album 'Joanne' from which two singles have been released ''Perfect Illusion' and 'Million Reasons'. It gave us a taste of the hits we might expect Lady Gaga to sing when she performs at this year's Super Bowl Half Time Show, which will likely one of the most-watched live performances of her career. No pressure then! Read more: James Corden Upstages David Beckham In Hilarious Underwear Ad! How amazing?! This might be our favourite Carpool Karaoke yet!